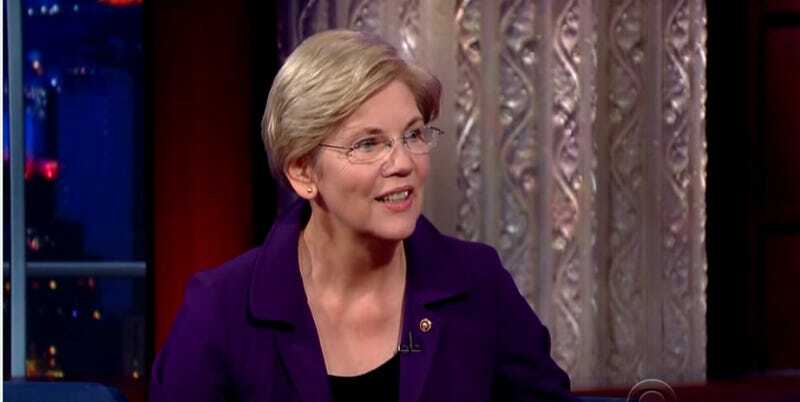 Massachusetts Senator Elizabeth Warren, one of the few people who might actually make a good president, is definitely not running for president, she told Stephen Colbert Wednesday night. Fighting income inequality and corporate control of America is a full-time job, she said, in so many words, and one she’s kind of enjoying. “Well, you don’t sound like you’re running for president, I’ll tell you that,” Colbert said dryly, as the audience cheered. Warren talked about using a model pioneered after the Great Depression, when Wall Street was relentlessly investigated, audited and overseen to figure out the causes of the stock market crash and keep it from happening again, and the Works Progress Administration both repaired the nation’s infrastructure and put a whole lot of people to work. Anyway, it’s not as fun as watching Donald Trump insist he loves women and call Hillary Clinton “shrill,” and yet it may just be slightly more important. You can watch the full interview here, beginning at 24:25.